It is the World Allergy Week (7-13 April), an annual World Allergy Organization initiative to raise awareness of, and advocate for, better management and prevention of allergies and related diseases such as asthma. With 9 out of 10 people on the planet breathing polluted air, known to both cause and exacerbate allergies, this is an important initiative. Dust, pet and pollen allergies are a growing global concern, costing the society millions of dollars every year in lost sick-days, medication and physician visits. Particularly, allergies among children are a rising worry. With the increasing level of air pollution year after year, people in India are increasingly concerned about the growing health diseases caused due to air pollution. Blueair in partnership with YouGov, an international Internet-based market research and data analytics firm, conducted a global study on Allergens. The study shows how people react to various allergens and indoor pollutants. As per the report, 71% of the Indians consider dust as a major pollutant that causes allergy, followed by bacteria, virus (63%) and smoke (56%). Apart from these, other forms of pollutants that Indians feel exist at homes and could be a major contributor to allergies are pollen (27%), pet hair/dander (33%), microplastic (28%) and chemical pollution (28%). 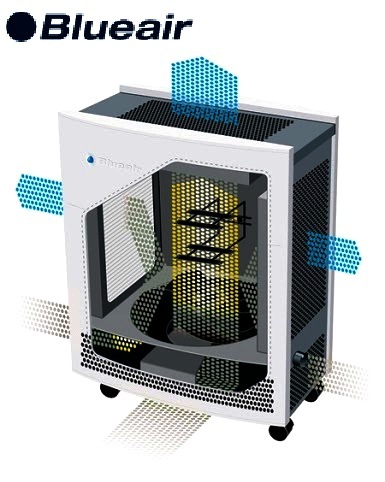 Thanks to the unique HEPASilent™ technology, which removes 99.97% of all airborne particles down to 0.1 micron in size including pollen, smoke, dust, mold, spores, bacteria, viruses and pet allergens, Blueair air purifiers have superior performance also at lowest speed. As a result, Blueair air purifiers are whisper silent, energy efficient and recommended for people with allergies and asthma. Blueair Classic 480i is designed for medium-sized room (40m²) and fit most needs and removes virtually all allergy and asthma triggers and other airborne pollutants - quietly and efficiently. Blueair HEPASilent-technology provides a top performance at all speeds and a virtually silent operation with minimum power consumption. A user-friendly touch display with clear LED icons provides an overview of the operating mode, Wi-Fi connection and filter status, in addition to indoor air quality with indications of the levels of PM2.5 and VOCs. Download the free app Blueair Friend and connect it to the Blueair Classic to control the operating speed, parental control, night mode and other functions remotely via smart device. Blueair Classic 680i gives a cleaner and healthier indoor air in larger rooms (72m²) and large living room, open space and offices. The air cleaner is also equipped with wheels making it easy to move, and with built-in sensors, to take control of the indoor air quality. Blueair HEPASilent-technology provides a top performance at all speeds and a virtually silent operation with minimum power consumption.